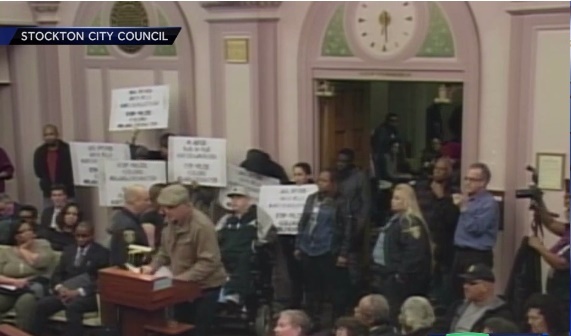 Last night's Stockton City Council meeting was disrupted by protesters from the Black Lives Matter movement. According to the Stockton Police Departments night watch report, about 30 members showed up and reportedly disrupted the meeting by yelling and causing a disturbance. The meeting was temporarily suspended by Mayor Michael Tubbs until the protesters were cleared from the council chambers. Before the protesters were removed and the meeting disrupted, one person speaking during public comment noted police officers in riot gear were already on hand. "It is our house we sit in," she said. "Having armed guards at the door is insane." Following the removal of the protesters Tubbs admonished the audience. "If you are going to continue to disrupt council business and council meetings, you will continue to get thrown out until the message gets understood," Tubbs said. The watch report said several officers were assaulted by the group as they attempted to move them out of the chambers. The protesters reportedly were using chairs to block the efforts of the police officers to remove them. Two body cameras worn by officers were knocked off during the confrontation with one still not being accounted for. Once the protesters were removed, they disbanded and left the area.